I have been running about three times a week to keep in shape and get ready for my next 5K race. Recently, I've been heading through the scenic venues of Ironwoods Park. I didn't take any pictures while running, but I'll try to add a few pictures when I get the chance. It's a very nice run. Here are maps of two recent runs. 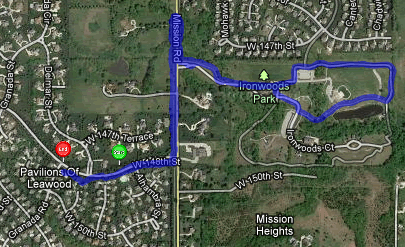 The first run (Saturday, September 10) took a shorter loop within Ironwoods Park. 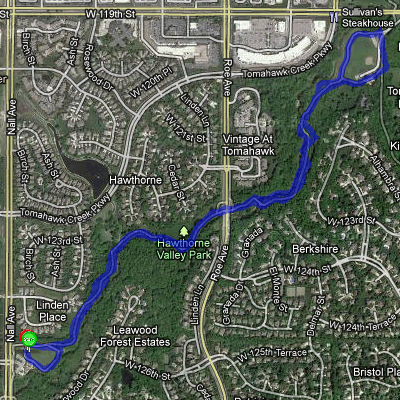 When I got back to my starting point, I stretched it out a tiny bit to get a total of 2.5 miles of running in. This run took 35 minutes, and would extrapolate out to a 43 or 44 minute 5K race. I was dragging quite a bit at the end, so that extrapolation is a bit optimistic. 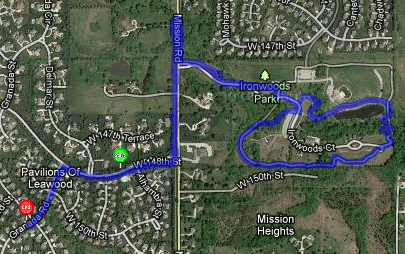 For the second run through Ironwoods Park, I took a slightly longer loop that took me up an extra hill. I wanted to stretch this run out to a full 5K and continued along 148th Street and down a few blocks on Granada Road. I finished a full 5K miles in 46 minutes. Again, I was dragging at the end, so when I build up a bit of endurance, I'll do much better. Niether of these times is as good as my most recent 5K race. 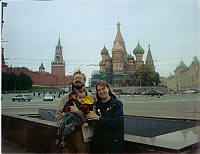 But I was running with our dog Cinnamon who sometimes will slow me down by darting back and forth. Also I didn't have the surge of other runners keeping me going at a faster pace. Still, I'm happy with any run where I don't hobble home injured. My heel hurts a bit, but my muscles are a tired sort of happy. My most recent run in iLan Park went well also. I ran 2.8 miles in 37 minutes, which would put me on pace for a 41 minute 5K. I tried to vary my speed, running the first minute, fourth minute, seventh minute, etc. at a very fast pace and the intervening two minute intervals at a more sustainable pace. Some of my very fast minutes were a stretch for me, corresponding to a 9 or 10 minute mile. Most were closer to a 13 minute mile. Note that I cannot run a full mile in 10 minutes yet. If I cover 0.10 miles in a minute, that would correspond to a 10 minute mile if I was able to string 10 consecutive minutes at that pace. If I cover 0.08 miles in a minute, that corresponds to 13 minute mile (well, a 12.5 minute mile if you want to be picky). My sustainable pace is closer to a 17 minute mile. I can go for a long time at this pace without really tiring myself out. Note the differences in 5K times. A 17 minute mile would produce a 53 minute 5K (close to my time in May 2011 in the Running With the Cows race). A 13 minute mile would produce a 40 minute 5K (close to my time in September 2011 in the Leawood Labor Day race). If I were strong enough to run an entire 5K race at a ten minute pace, that would mean I'd finish in 31 minutes, which is still a dream. Just to let you know what my competition is up to, a 59 year old man finished the Leawood Labor Day race in 19 minutes. That's a 6 minute mile. I've never come close to that pace, even for a single minute of running.